September 23, 2011 Comments Off on Gary Setzer LIVE@SV! Up next week is Gary Setzer, the energetic interdisciplinary artist from Arizona! His performances, installations, objects, and videos have been exhibited and screened extensively. Setzer has recently toured his new performance work, Supralingual/Sublingual: The Tongue is the Terrain across the United States. 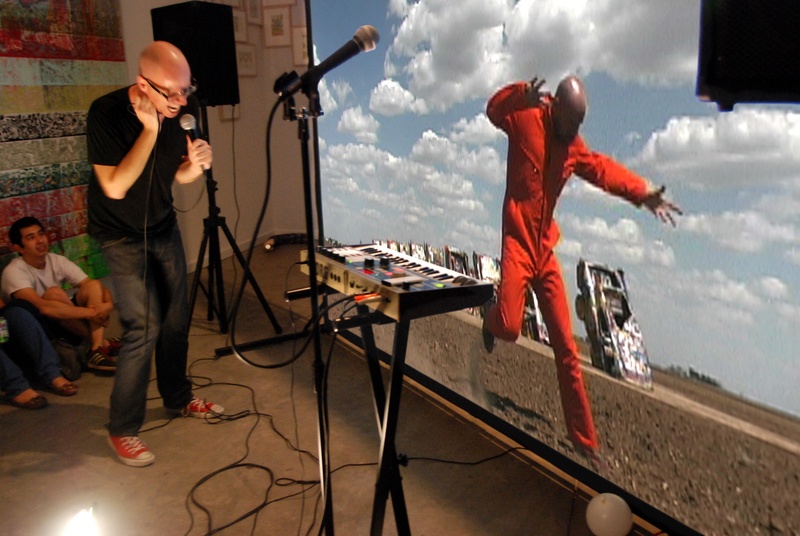 With stops in New York, Brooklyn, Chicago, Philadelphia, Pittsburgh, Denver, New Orleans, and Austin (among others), he provided gallery audiences with what the Huffington Post called “a phenomenal hybrid of his own, integrating video, music and performance.” In 2008, Setzer’s performance work, Simultaneous Repellents (Repressed Sentient, Oppressed Séance), debuted in London at the Slade School of Fine Art. In May of 2010, Setzer received the Louise Foucar Marshall Professorship—a distinguished honorary title and award from University of Arizona, where he is an Assistant Professor of Art. You are currently reading Gary Setzer LIVE@SV! at STUDIO VISITS. Comments: Comments Off on Gary Setzer LIVE@SV!